HUDSON, MA--(Marketwire - Oct 30, 2012) - Anver Corp. is introducing a new self-contained vacuum-operated inspection station that grips heavy enclosures from the sides and lets operators fully inspect the front, back, top, bottom, and inside. It can also lock into position if work on the part is necessary. The Anver Vacuum-Operated Inspection Station lets operators pick up heavy enclosures from the sides and visually inspect the front, back, top, bottom, and inside without excessive bending or awkward positioning. Featuring a pendant control, this inspection station can rotate the load 180 degrees and be locked in any position if service to the inspected part is required. Ideal for inspecting enclosures, electronic chassis, instruments, and appliances, the Anver Vacuum-Operated Inspection Station is built from all-welded steel to customer specifications. Powered by air- or electric-operated vacuum stations, it includes a vacuum reservoir, an alarm system, automatic shut-off, and features large rubber non-slip vacuum suction cups. The Anver Vacuum-Operated Inspection Station is priced from $ 8,995.00(list), depending upon construction and special customer requirements. Price quotations are available upon request. Founded in 1968, Anver Corporation has a rich history of innovation and a tradition of excellence. The company designs and manufactures a broad range of vacuum system components including suction cups and vacuum cups, specialized suspension systems, air, mechanical, and electric vacuum pumps and vacuum generators, vacuum gauges, ergonomic vacuum lifters, tube lifters, powered vacuum lifters and tilters, vacuum transfer systems, automation and EOAT (end-of-arm-tooling), and complete custom vacuum lifting systems to meet the most challenging customer requirements. Considered the leading North American Manufacturer of vacuum material handling equipment, Anver Corporation is fully integrated and involved in all aspects of vacuum equipment production. The company is a mold maker, a rubber molder, components manufacturer, equipment builder, machine shop, custom design house, and a consulting firm; all in one. They design and build their equipment in Hudson, MA, USA and sell worldwide. 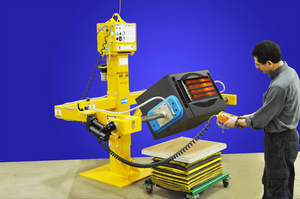 The Anver Vacuum-Operated Inspection Station lets operators pick up heavy enclosures from the sides and visually inspect the front, back, top, bottom, and inside without excessive bending or awkward positioning.